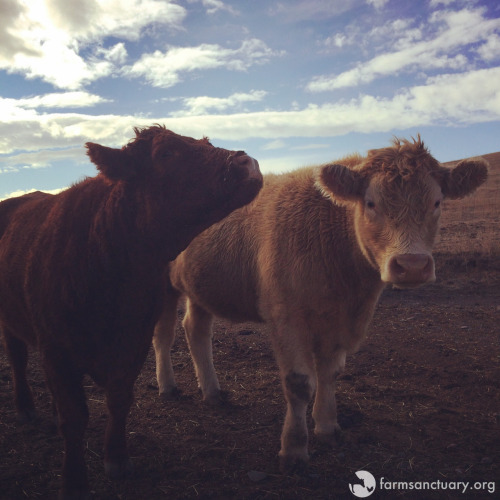 It was a hot day in the summer of 2013 when Stefan steer stepped off a trailer and onto Farm Sanctuary soil for the first time. These initial steps signaled the beginning of a new life for this beautiful boy. Stefan was raised by a teenage girl through a 4-H program. From the time he was four months old, his young guardian had cared for him and prepared to show him in the local fair. In fact, a newspaper article about the fair that featured Stefan ended up saving his life. A Farm Sanctuary supporter saw his picture and was determined to save him from the gruesome fate that awaits most animals raised through 4-H and Future Farmers of America (FFA) programs, who are shown by their young handlers and then auctioned off at the conclusion of the fair. The children and teenagers who have raised them say goodbye, knowing that the animals they’ve cared for will be slaughtered. Stefan is one of the lucky few to make it out. 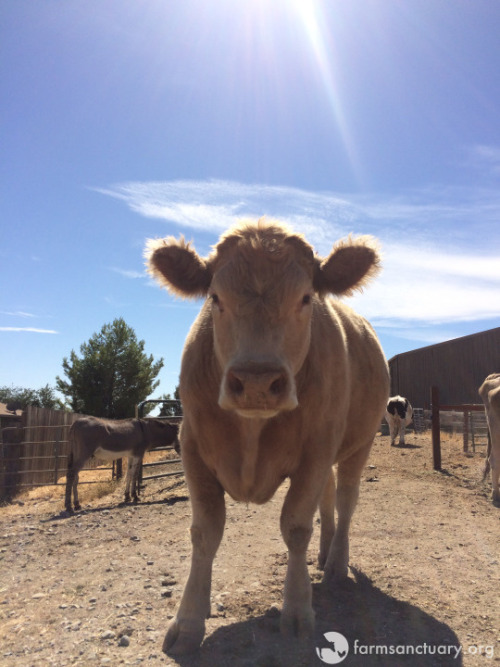 Rather than being sent to slaughter at the conclusion of the fair, he was instead loaded onto a Farm Sanctuary trailer and brought to our Northern California Shelter, where he has lived ever since and will spend the rest of his days — safe and sound. 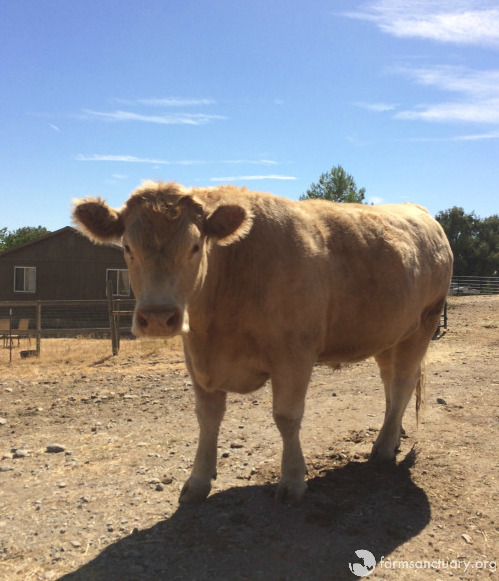 Once at the sanctuary, Stefan immediately took to the other cattle, and while he had to kept separate from them during his initial quarantine period, he didn’t take his eyes off the other members of the herd. He immediately took to the other cattle and has never looked back. He prefers the company of his bovine buddies to any of the humanimals. He is never far from the main cattle herd, and spends most of his days grooming, and being groomed by, his buddies! When he is not busy with his grooming responsibilities, he’s exploring the spacious pastures that he and his herdmates have access to. Stefan has become known for his teddy bear face — which becomes even fluffier during the winter when he has his winter coat! His good looks don’t go unnoticed by anyone who meets him. Stefan is now safe at Farm Sanctuary, and will never again be seen as a commodity — here, he is seen for the unique individual he truly is. Every summer, we receive multiple requests from people seeking to spare 4-H and FFA project animals from auction. Over the years, we’ve helped place several animals from 4-H and FFA projects; some others, like Stefan, have found a home with us. We evaluate each request on a case-by-case basis and are not able to assist in every case; for example, some animals are legally owned by the program, rather than the 4-H or FFA member, and in other cases, the animals are required to be sent to slaughter by the rules of the auction. Further, we do not purchase animals to rescue them or permit others to do so in an effort to have them rescued by us. And in order for us to be able to help, the 4-H or FFA member must agree not to raise any future animals through these programs. To contact us about an animal in need, please email [email protected]. If Stephan is a steer he is not a COW! 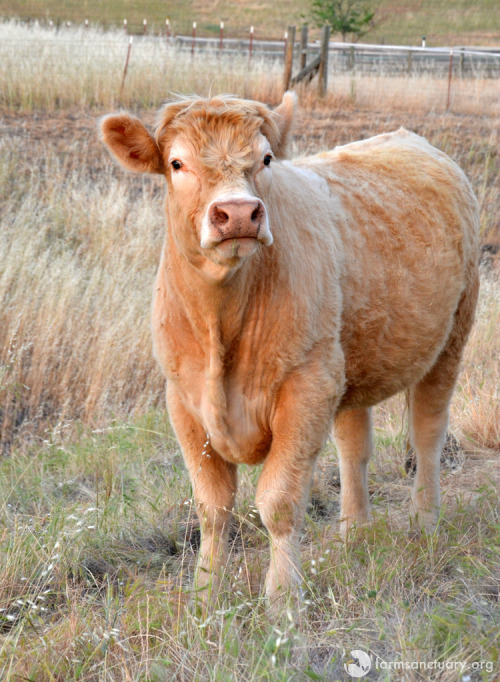 the term cow is only for females cattle. Anyway glad he was rescued. 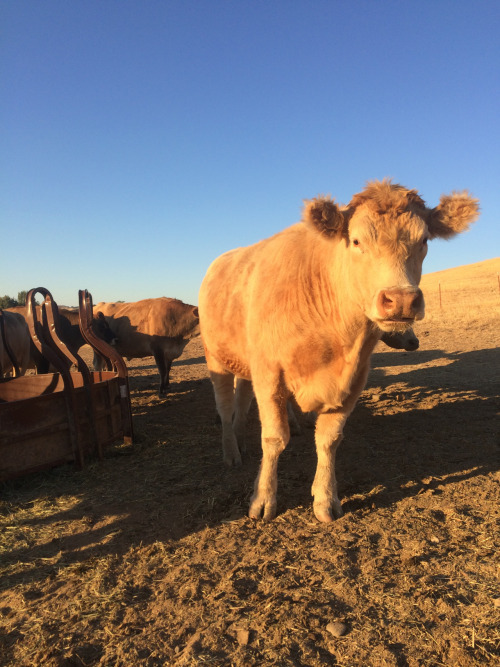 I do come from a long line of cattle ranchers so while I\’m happy for this one I am ambivalent over the term "rescue". This is a Wonderful story with a Very Happy Ending for Stefan. It was an Amazing Success story by people with Loving Hearts.